Writers take a gazillion notes. I don’t have to tell you this, because you know all about it. 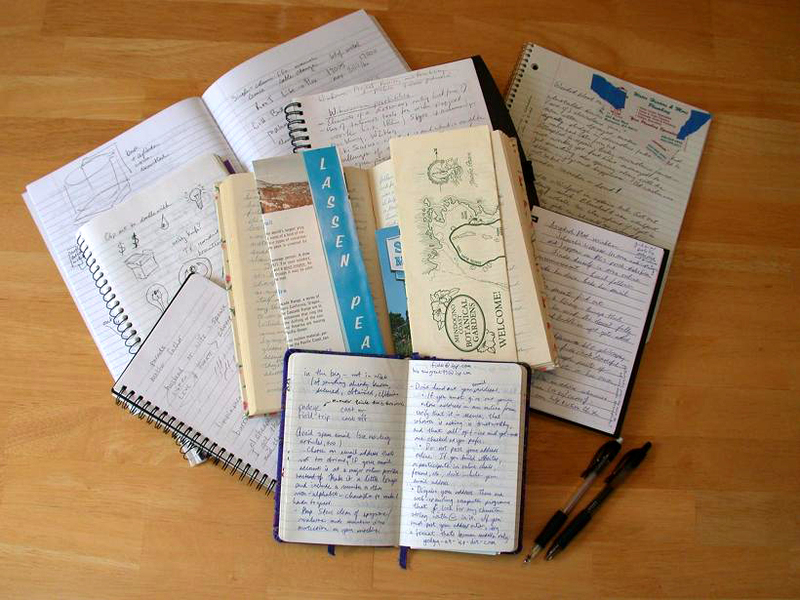 You also know how difficult it is to organize notes, search through paper notes, and sometimes even find all the notes you've written. The following is an excerpt from "Technology #WritingTips for Writers". First 100 subscribers at http://www.cherylcowtan.com get a free copy at book launch. Okay, okay, bad simile. But seriously, finding the right software for our writing needs can be painful and expensive. So let's stop wasting time and money and get organized. In the name of efficiency (which leads to more time for writing), we have to make a choice. I say to you, today, we will be together in the cloud! Here's how. After trying a number of software options for organizing my writing research and outlining my novels, I was getting discouraged. Then I tried OneNote! For me, the app has been such a revolutionary organizer, I'm writing a book about it. Here's why I love it. It has an easy-to-use interface (no headaches, self-esteem damage, confusion, trying-and-giving-up in despair, AND no need to take a course to learn how to use it). It will import your material from other software like EverNote, Excel, Microsoft, the web etc. It has a deep hierarchy (levels of storage), which allows you to keep filing and splitting off that filing and filing some more. (No deleting, recreating, and duplicating unnecessarily). It's accessible from multiple platforms and devices (from your phone, desktop, laptop etc.) because it stores on the cloud. If you have a Microsoft Office license, OneNote is in your programs. 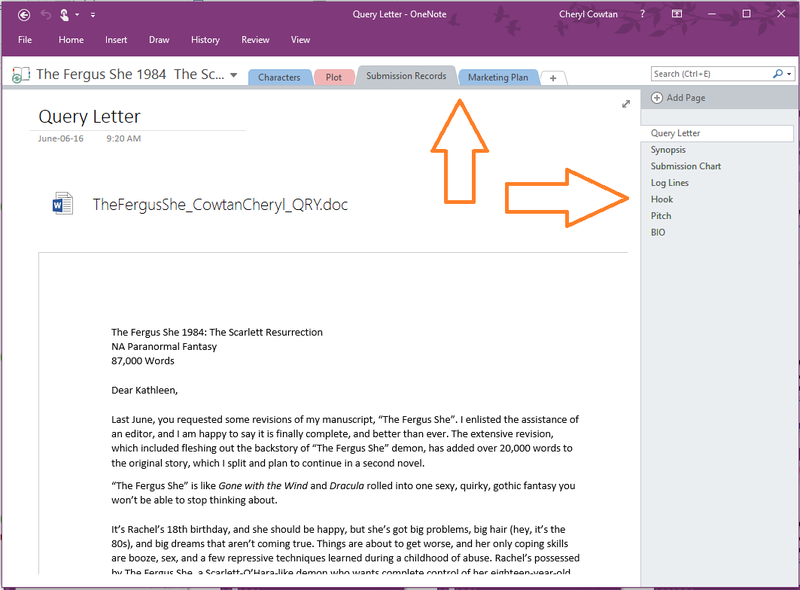 Click your "start" menu on the bottom left of your Windows screen and search OneNote. If you are using a mobile device, OneNote is available free through your app store. If you have a WindowsLive, Hotmail, or Outlook e-Mail account, you can download OneNote free from Microsoft. The Notebook is at the top, followed by sections, then followed by section pages. Type in the Notebook Name. I used the name of my novel, The Fergus She 1984 The Scarlett Resurrection. At this point, you can also choose to share your Notebook by inviting people. If you're not sure, just select "Not Now". 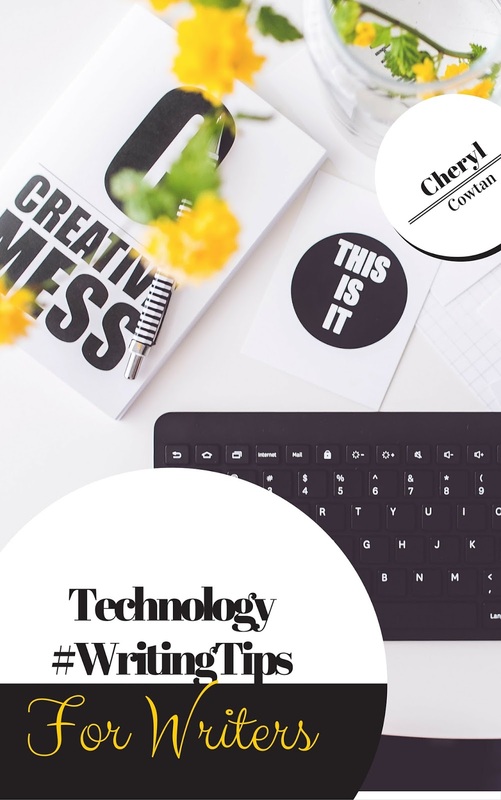 The first 100 readers to sign up to my mailing list at my Website will receive a free copy of my "Technical #WritingTips Book for Authors" book, when it launches. Once you are in the Notebook, you can start building your sections and pages. You might call your sections Character, Plot, Research, Marketing Plan, etc. Under each section, you will create pages. 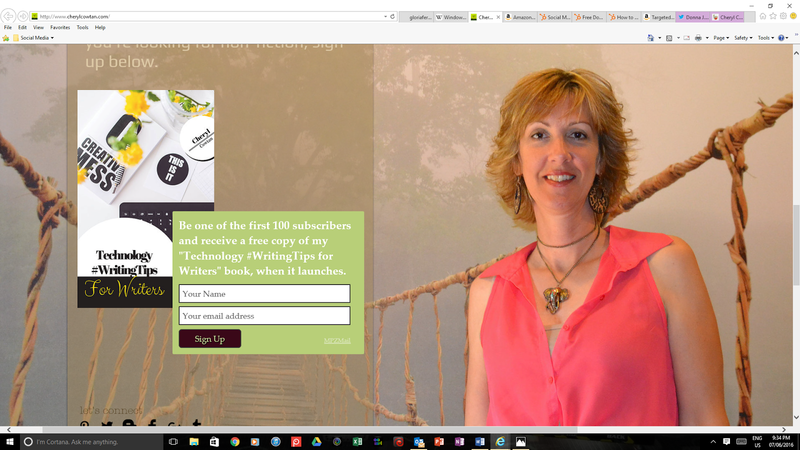 Under Character, you could have the character profile of the main characters in your novel as each individual page. 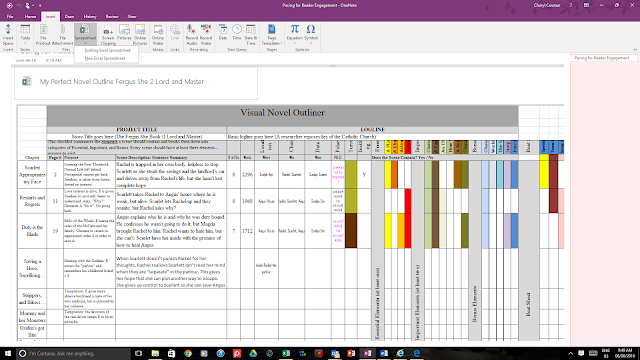 Under Plot, you could have pages outlining your three act structure, or your chapters, or whatever order you like to plan your writing in. This is where you have to store your notes on the cloud so you can add and use your information no matter where you are or which device you're using. 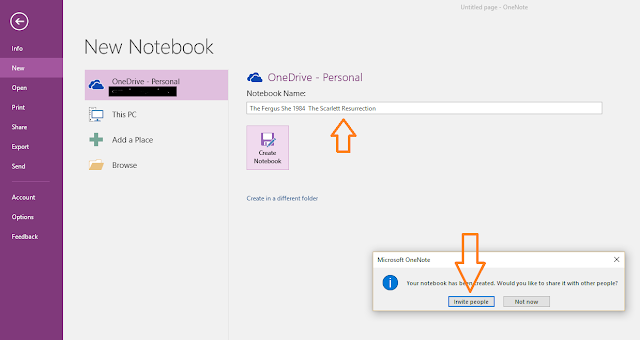 Set your OneNote up for “Cloud” sharing if you are going to access it from more than one device. 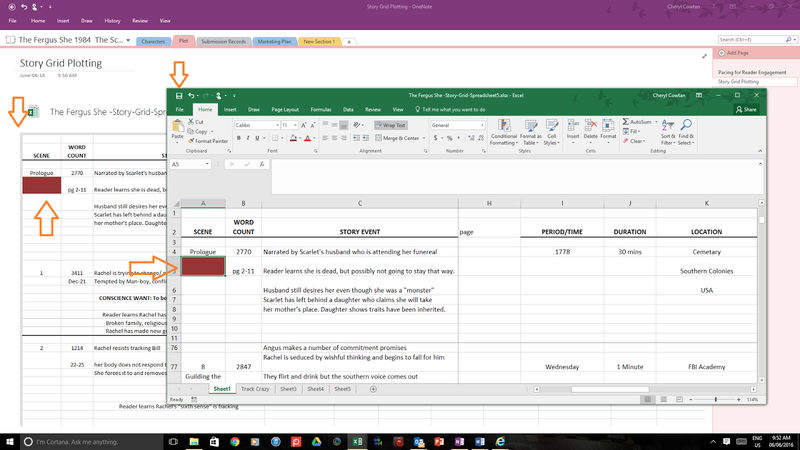 One of the best features about OneNote (for me) is the ability to imbed images, Excel and MS Word docs into the OneNote application. 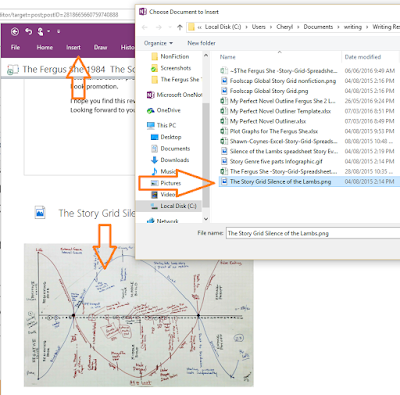 Now instead of the multitude of files I have on my computer, it will all be well organized in my OneNote Notebook. Go to the page you want to insert a file into. Select "insert" for MS Excel or "attach" for MS Word. Your other option is "file printout" for showing an image or doc file. 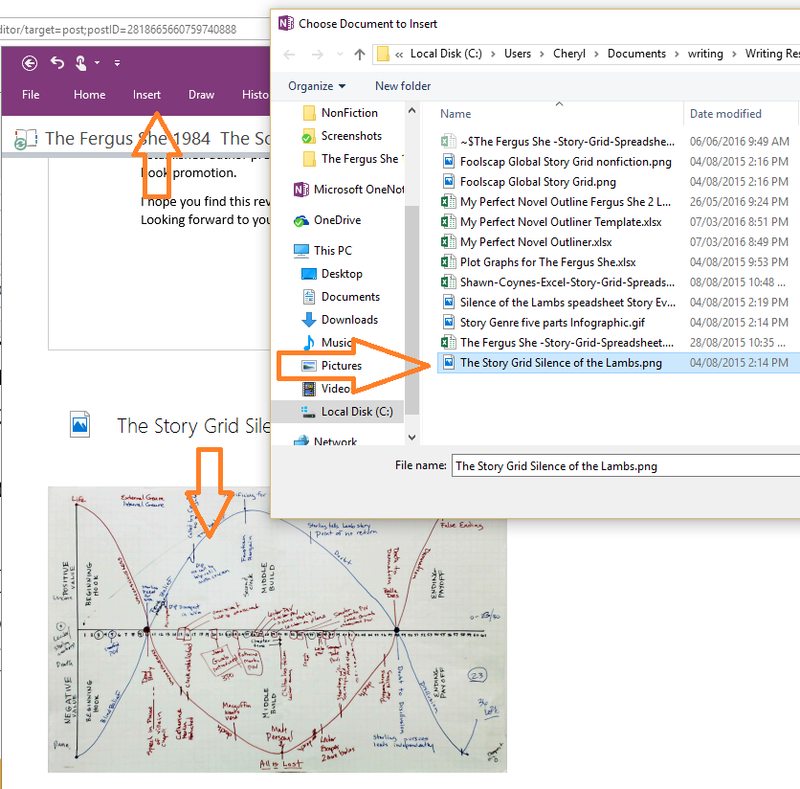 What Happens if I edit a file after I put it in OneNote? This is a great question. 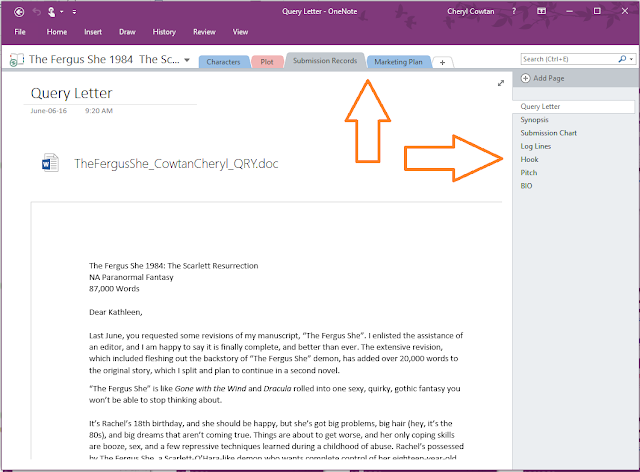 Once a file is in OneNote, you can edit the original and OneNote will make the update for you. That's the best thing since moleskin notebooks, eh? Run your mouse over the top left of the document showing on your NoteBook page until you see the word "edit". Click it. Your original file will pop up on the screen, as you can see above. Make a change. I added a colour to row 5 column 1. Click "save" in your original file. The change will then appear in your NoteBook version. As a fellow writer, I really hope you find OneNote to be as functional and easy as I did. If you have any trouble, click the "help" link on the taskbar or do a search in Google. If you liked the layout and structure of this blog, you'll love my more-in-depth novels on using technology to help you be a better writer. I am currently writing three non-fictions on using technology for writing, publishing and marketing. Want to learn more? Click here to sign up for my mailing list. If you make it into the first 100 readers to sign up, you will receive a free copy of Technical #WritingTips for Authors, when it launches. If you don't make it into the first 100, I'll let you know when the book is for sale.